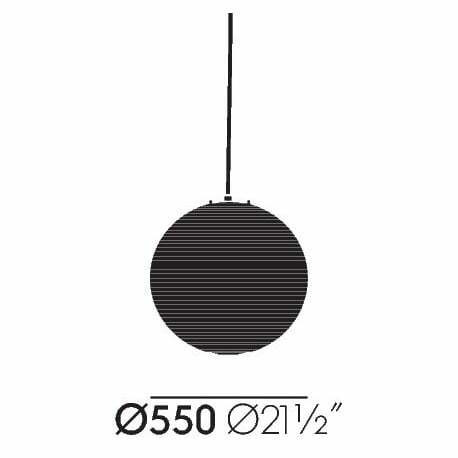 The Akari 55A Ceiling Lamp is one of the Akari Light Sculptures designed by Isamu Noguchi. ‘Akari' is the Japanese word for brightness, light and lightness. That is why in 1951 the American-Japanese artist and designer Isamu Noguchi gave this name to his light designs made from shoji paper. In total, the artist designed more than 100 Akari Light Sculptures - table lights, standard lamps or ceiling lights. The Akari 55A Pending Lamp is made by hand entirely in Japan, with handmade paper and on the original wooden shapes of Noguchi. Available at Designcollectors in 4 different sizes. Isamu Noguchi about his lamps: "The light of Akari is like the light of the sun filtered through the paper of shoji. The harshness of electricity is thus transformed through the magic of paper back to the light of our origin - the sun - so that its warmth may continue to fill our rooms at night."